Almost every hitter I know has been told they shouldn’t drop their back shoulder. 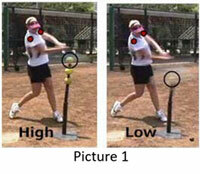 Read on to see why this is not only bad advice, but crucial for hitting strikes! I’m sure you’ve told hitters to “stop dropping your back shoulder”. We’ve all heard it, most have taught it and hopefully I can convince you why it’s wrong. I work with tons of hitters that think they shouldn’t drop their back shoulder, or I hear parents or coaches tell me their hitters are dropping their back shoulders. Not dropping your back shoulder is definitely a hitting myth that falls into the coaching hearsay category. But don’t just take my word for it, let me show you with pictures, why hitter’s must drop their back shoulder when hitting. Before we delve deeper let’s first define a hitter’s back shoulder. The back shoulder is the hitter’s shoulder that starts closest to the catcher when she’s in her batting stance. If you look at this vintage picture of Jessica Mendoza when she was a member of our 2008 Olympic Softball Team, Jess is in her stance. You can see her back shoulder is her left shoulder (the one with the yellow arrow over it) since she hits lefty. If you hit right handed then your back shoulder is your right shoulder. Taking a closer look at the back shoulder position in her stance you can see that it starts out pretty much level with her front shoulder. But, where it starts has no bearing on where it ends up at contact so don’t fall into that trap. When we look at a hitter contacting 2 different locations of pitches; one high and one low then we see the shoulders start to change. Notice in Picture 1, the two red circles over the hitter’s two shoulders. In both cases – for the High and the Low pitch – the back shoulder (which is now the one closest to the ball) is lower than the front shoulder, not by much on the higher pitch but still, the shoulders are in no way level at contact. Picture 2 shows the front view and shoulder angle is much easier to see. It also definitely corresponds with the height of the pitch. In looking at the High Pitch the yellow dots show the hitter’s back shoulder is only slightly lower at contact than her front shoulder, but still, it’s definitely not level. The pitch where the statement “don’t drop your back shoulder” makes no sense at all is the Low pitch. Look at the hitter to the right in Picture 2, she’s hitting a Low pitch and she has drastically dropped her back shoulder in order to do so. There is absolutely NO way a hitter could reach this pitch with her bat without dropping her back shoulder! No Way! Also notice how the shoulder angle on both hitters is pretty much in line with the ball and pitch location. Focus on the Barrel, Not the Shoulder – While I’ve spent this whole article talking about a hitter’s back shoulder that’s because we’ve been analyzing the swing from a technical point of view. But when you start teaching this concept to your hitters you want their focus to be on the barrel of the bat driving into the ball and not on making sure their back shoulder has lowered. Be sure to keep your player’s focus on whatever is their priority. In this case we’re talking about hitting – that is, the bat hitting the ball – so keep their focus on the barrel of the bat going to the ball, wherever the ball is in the zone. Hit the Middle of the Ball – One simple reason coaches tell their players to “not drop their back shoulder” is because their hitters are popping up. This is due to the fact that the hitter is hitting the Bottom of the ball instead of the Middle or Back. Work on your hitters hitting the Back or the Middle of the ball instead of the bottom or the top or even the side and your hitters will have far more success. The Drop is Going Forward – While we’ve established that hitters do in fact drop their back shoulders when hitting, make sure you know this happens as the player’s hands are moving forward toward the contact zone and not behind them. Many young hitters will keep their hands behind them for most of their swing causing all kinds of problems, the least of which is hitting the bottom of the ball. Your hitter should take her hands forward to the ball no matter where the pitch is! If you’re looking for more info on the details of hitting, then check out all of our great Hitting eClinics and eDrills – available within our Vault Classic membership! Thank you so much for writing this article. As a hitting coach, I have been fighting this battle for years with little success, as the myth is so ingrained. As your picture on the bottom right of the article accurately shows, hitting requires two things, the front side to clear and the back shoulder to drop behind the back elbow for leverage. This is very similar to a boxer’s upper cut. Try to throw an upper cut without getting the shoulder of the striking hand behind the elbow. Hitting is no different, baseball or softball.